Last weekend I took a trip with a fellow Jeomchoner to Juwangsan National Park. This park is a few hours away from Jeomchon, so we caught a bus to Andong, then transferred to Cheongsong, the neighboring town on Saturday afternoon. We arrived in Cheongsong, a VERY small town, in the evening, and shortly after found a place to eat, then found a motel to stay at for the night. Cheongsong was definitely the smallest town I've stayed in in Korea, and it really made me thankful that I live in Jeomchon where there's more civilization. I'm not sure how I would have coped with living in a town like that. 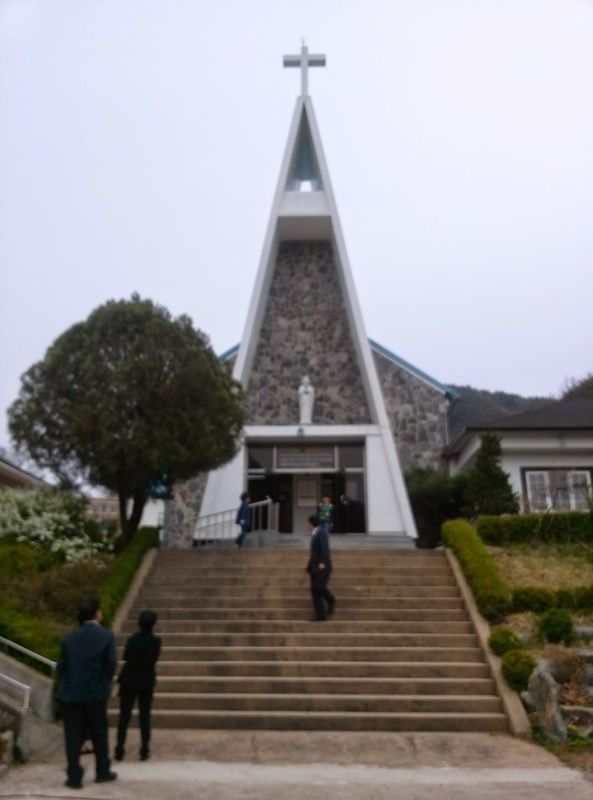 Sunday morning was Palm Sunday, so I had requested that we go to church before heading to Juwangsan. We found a catholic church in town, and headed over around 9, thinking mass would be some time around then. However, we after waiting for some time, a nun informed us that mass wasn't until 11. We waited around for a bit and got some coffee, then came back for church. I don't think that church is used to seeing foreigners, and I kind of got the impression that they'll be talking about our presence for years to come: "Remember that time those foreigners came for Palm Sunday!" Of course everyone invited us to lunch afterwards (Koreans are generally friendly, but they are EXTRA inviting at churches). However, we had to get moving to make it to the park so we weren't able to join the lunch with the parishioners. Such a small, quaint church. 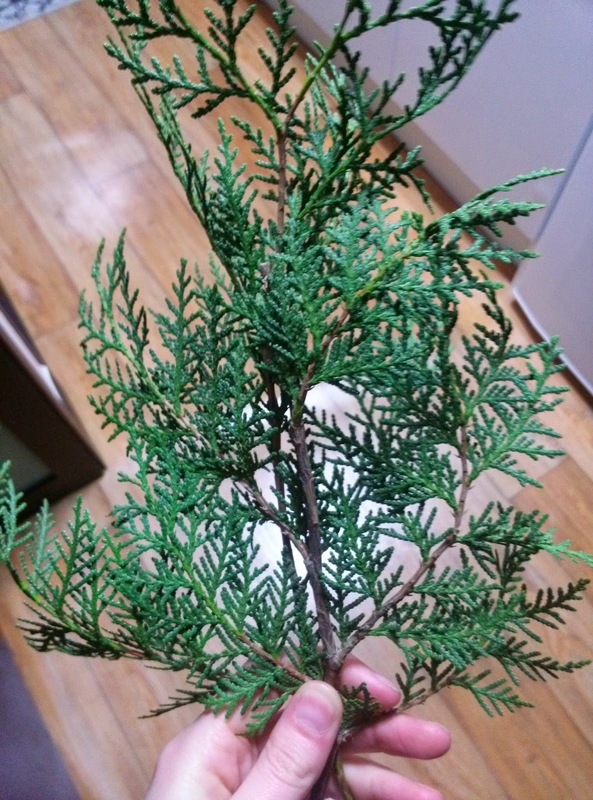 My "palms" I got at church. Definitely a first. We caught a bus to Juwangsan, and got some food before we started our hike. One thing I love about Korea is all the food options when you're hiking. There are always tons of places to eat and drink at the beginning of a park, and there are also other small places to eat while you're on trails. Hiking doesn't really feel like hiking in Korea without makgeolli and pajeon. The typical Korean hiking food. We finally got on our way and walked through some beautiful trails. Junwangsan has some really beautiful rock formations. It reminded me a bit of the flume back home. We also saw some lovely waterfalls along the way. Lovely view. There were still lots of cherry blossoms in Juwangsan, which made me very happy. The lanterns that were hung throughout are for Buddha's birthday. One of the three waterfalls we saw. After enjoying the park for a while, it was time to begin our journey home. By 8:30 I was back in Jeomchon, and definitely ready for bed!